The Mediterranean diet, which has been shown by hundreds of peer reviewed scientific journal articles to be one of the healthiest diets on earth for preventing chronic disease including heart disease, stroke, cancer, diabetes and obesity. The Mediterranean diet is rich in plant-based foods such as grains like pasta and bread, vegetables, fruits, legumes, nuts, seeds, olive oil as well small portions of fish, seafood, lean meat, cheese and wine. Can you set the record straight on pasta, which is sometimes mistakenly cut back on due to recent fad diets? Pasta is often mistaken as one of those foods that we need to cut back due to recent diet fads promoting low-carb and gluten-free diets. However, despite common misconceptions, pasta does provide the perfect foundation for a healthy diet and is part of the Mediterranean diet, considered one of the healthiest diets in the world. As a complex carbohydrate, and when cooked al dente, most pastas have a low Glycemic Index value, making it a great way to get grain-based foods into your diet. Low Glycemic Index foods promote satiety and go into the blood stream slowly preventing blood sugar rushes, which is better for your health. In addition, it’s tasty, easy to make and can be a source of B-vitamins and fibre. To benefit from even more nutrients from your pasta meals, consider adding Barilla PLUS pasta into your weekly dinnertime routine. Barilla PLUS is a new premium, multigrain pasta which contains protein, fibre and omega-3 polyunsaturated fatty acids. It tastes great and it’s a quick and easy solution for providing a delicious balanced meal that even the pickiest eaters in your family will enjoy. What are some easy ways to incorporate more Mediterranean eating patterns here in Canada? Don’t be fat phobic! Some people have been unnecessarily removing even healthy fats out of their diet. Research is showing it is the TYPE of fat that is most important. Healthy fats in the Mediterranean such as olive oil, nuts and fish are good things to eat regularly. 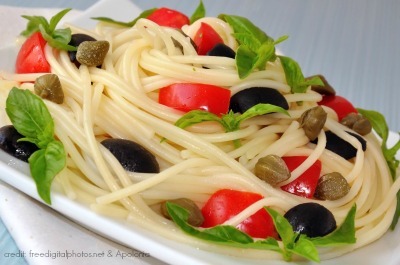 Pro pasta: The Mediterranean diet includes pasta as a staple. Use a good quality pasta cooked al dente and enjoy healthy additions such as olive oil, nuts, grilled seafood, beans, tomatoes, plenty of veggies and a sprinkle of strong cheese for flavor. For added protein, fibre and omega-3 fats (which are all key nutrients in the Mediterranean diet), try the new Barilla PLUS pasta. Boost your veggies! The Mediterranean diet includes a wide variety of veggies and fruits. Try something new such as eggplant, arugula and broccoli rabe. They are all loaded with phytonutrients to prevent cancer and heart disease. Try grilled eggplant slices brushed with olive oil and garlic on the BBQ. Try arugula on a mushroom pizza or as a salad with a lemon and olive oil vinaigrette. Try broccoli rabe sautéed or roasted with olive oil, balsamic vinegar and topped with toasted nuts. Sensible portions of seafood and meats: If you like fish and seafood these are great additions to your weekly supper meals. Choose small portions of meat, poultry and cheese for protein. The Mediterranean diet emphasizes a plant-based diet, which is not only good for you, but it is also good for the environment. Find balance: The Mediterranean is known for both whole grains as well as some white breads, white pastas, couscous etc. and they still achieve good health. Asia is the same with white rice. No extremes are necessary – food needs to be both healthful and soulful. You don’t need to eliminate white foods such as white rice, white pasta or white bread totally out of your diet. Health Canada suggests consuming half or more of your grains as whole grain. Share: In true Mediterranean style a good meal is often accompanied with a glass of wine and the company of family or friends at a slower pace to truly savor the food. Where can I find out more information on the Mediterranean diet and recipe ideas? For additional recipes, please visit www.barilla.ca and on Facebook at http://www.facebook.com/barillacanada. Probiotics Versus Prebiotics – What’s the Difference?